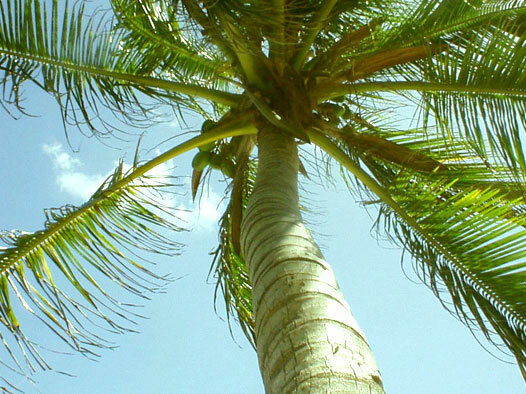 The Coconut Palm, free food, free drink and would it be a tropical beach without it? Seasonings: shadon bene, french thyme, fine leaf thyme, garlic, pimento (flavour) pepper. Made by breaking a dry coconut, chipping and finely grating the flesh and adding it to a cup of water. Squeeze grated flesh in water and then sieved to remove the flesh. The resultant ‘milk’ is ready for use. Clean corn. Chop and soak the pig tail in warm water with lime to remove excess salt. Chop seasonings except the peppers. Boil the corn gently with the seasonings in a little water for about 15 minutes Add the pig tail and coconut milk. Break open the pimento peppers but NOT the hot pepper unless you like the boiled corn peppery hot! Boil to thicken sauce. Serve and enjoy! Corn planted in June is now being reaped and the ladies selling outside the supermarkets now add Boiled Corn and Corn Soup to their offerings!